Bethesda’s recently released Fallout 4 VR is a title that has not only been feverishly anticipated by virtual reality enthusiasts, but also a source of controversy since its announcement. Unpopular decisions such as only (officially) supporting the HTC Vive or not including any of the original’s DLC haven’t been enough to sway those who believe that Fallout 4 VR will, in a sense, legitimize VR as a gaming platform. Nothing exists in a vacuum, and this being VR’s biggest title in both scale and name recognition, its success or failure has unprecedented potential to influence the industry. As someone who wants the VR industry to succeed, as well as a fan of quality gaming experiences in general, I’m happy to report that Fallout 4 VR is, in many respects, the best way you can experience the post-apocalyptic RPG. From a critical perspective, this title was rare for me in that the more I played of it, the more impressed I was. Due to a bug that was quickly patched by the developers, the image in the HMD was initially a blurry, low-resolution mess with distant objects being nearly unidentifiable. And while some amount of blur on distant objects still exists, the image quality overall is surprisingly clear. 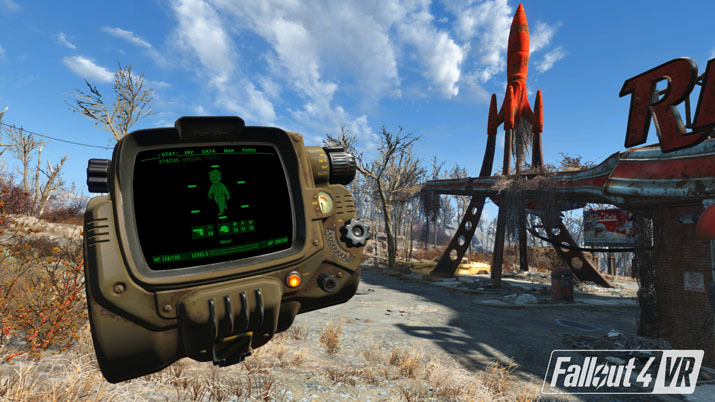 Considering Fallout 4’s size is many times that of the average VR release, it’s impressive how little compromise in the visual department there is.. Another early impression was that the title was awkward and overly complicated to control, a problem which mostly goes away after the few hours it takes to get accustomed to things. I say "mostly" because while exploring, looting and causing chaos across Boston’s 23rd century wasteland soon became second nature to me, there were still times where I’d activate the main menu when I meant to trigger V.A.T.S, or I accidentally dropped a molotov cocktail on myself because I forgot how to unequip my pistol. Unfortunately, this is just the unavoidable problem that arises when mapping a mouse and keyboard title to the comparatively limited Vive wands. The controllers’ trackpads are fine when used for movement or when a large part of their surface area is used for a single button press — the shortcomings of the trackpad rear their ugly head, however, in the navigation of menus (a major part of the Fallout 4 experience). It seems like whether it’s choosing a perk, selecting an inventory item, or lockpicking a door, the trackpad always seems either too sensitive or not sensitive enough. Bethesda can’t be blamed for the design flaws of the Vive controller, but it’s a problem worth highlighting regardless. The way the trackpad is often poorly suited to the gameplay is indicative of the most significant problem Fallout 4 VR has: it is a “flat” game converted to virtual reality rather than an experience built from the ground up with the platform’s strengths and weaknesses in mind. Actions such as reloading being relegated to a button press is one such example. The satisfaction of grabbing a magazine from your hip and sliding it into place, as seen in many VR shooters, is replaced with merely watching the animations happen as if a ghost were performing them. These irritants range from not being able to flick a double-barreled shotgun closed, to the lack of interaction with, say, stimpacks for example which in most VR titles would require you to actually jam them into your body. It was always unlikely that Bethesda would redesign every aspect of Fallout 4 for the new platform, but it’s still a little disappointing that more wasn’t done here, serving as a reminder that this isn’t a pure VR title. So considering its flaws, why do I claim that this the best iteration of Bethesda’s open world shooter? In this title especially, where much of its appeal lies in its fully realized setting packed with world-building details, what VR adds in the way of immersion is invaluable. Buildings and structures that I’ve explored a half dozen times before in the base game come alive here and make me pay attention to details I’d otherwise overlook. Approaching the Corvega factory and truly comprehending it’s scale for the first time is awe-inspiring, made all the more so by the fact that it exists in a seamless open world that you feel a part of. Similarly, radroaches which usually evoke nothing more than mild annoyance, actually instill a sense of panic this time around as they creep toward you. The best compliment I can give Fallout 4 VR is that it caused me to take my time and leave no stone unturned, something I hadn’t done to such a degree since my first playthrough of Fallout 3. 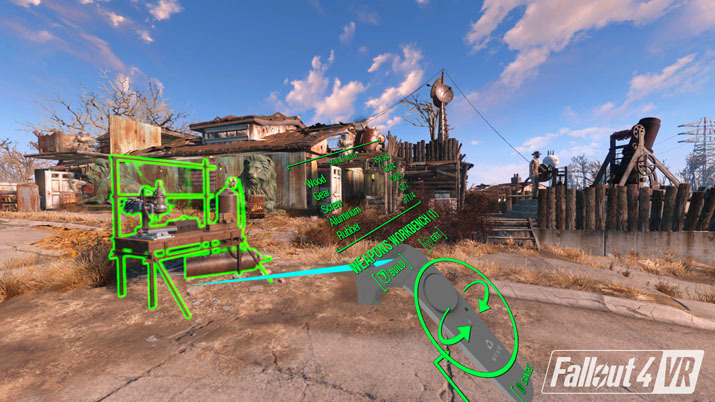 Bethesda has not translated Fallout 4 perfectly to VR: controls are often not as responsive as you’d hope, and evidence of “flat gaming” roots abounds. But Fallout 4 VR brought the entirety of the massive, content-rich adventure, packed with potentially hundreds of hours of gameplay, to VR, and it did so with little in the way of graphical compromise. No other virtual reality title is as technically advanced, and almost none offer the value for money found here, either. Bethesda has set the standard for future AAA VR; for that reason alone, they deserve commendations.